Item description: Heuer brought out the re-issue of the Monaco in 1998, realising there was a huge interest in this watch, famously worn by Steve McQueen in the film, Le Mans. This example dates from 2009, and is new old stock. Typical large stainless steel case with brushed and polished surfaces. The dial in deep blue with Heuer logo and model name. The dial with two sub-registers at 3.0 & 9.0 positions, along with a calender at 6.0. The watch with its original dark blue / black crocodile strap, and stainless steel deployment clasp. 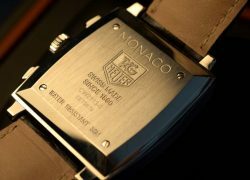 The case-back with full Monaco markings. The movement an automatic cal.11. 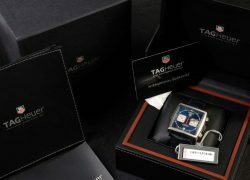 Additional description: The watch remains in its original Heuer packaging, consisting of black case, outer black branded box, along with white card slip over storage cover. The watch still has its original Heuer wallet with full instructions and also the guarantee card dated 2009. Remaining inside the box is the plastic Heuer model reference seal, and the packet of silica gel. Condition report: New old stock condition. Storage age only. 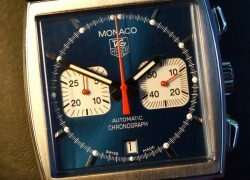 This example of a Tag Heuer Monaco, remains in brand new condition. As well as the watch itself, all the packaging remains as new condition. Background to Heuer: The Heuer Watch Company was founded in 1860 by Edouard Heuer. He opened a watchmaking workshop in St-Imier, a village in the Swiss Jura region. Heuer watches soon became recognized for a high level of accuracy and workmanship. By the 1930s, Heuer was specialising in chronographs, and stop watches, becoming known as a producer of timepieces sporting events. 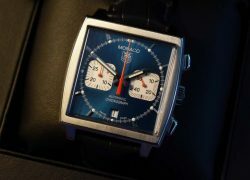 Heuer continued with this theme, and by the 1960s had brought out various timepieces for use within the car racing world. 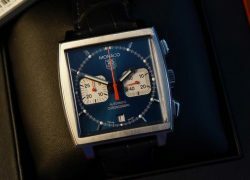 Today, Heuer is particularly remembered for their Heuer Monaco model, which was made famous by Steve McQueen when he wore it the 1971 film, Le Mans.